A text message saying, "FWIW" on a smartphone. 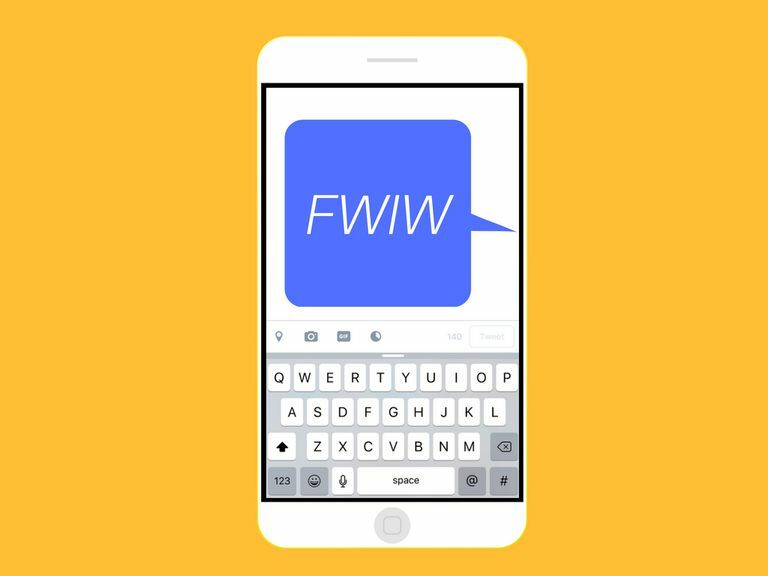 Did you just spot a comment online or receive a text message that begins with the acronym FWIW? This is a hard one to interpret just by looking at it and taking wild guesses. This is a popular phrase you might hear used in everyday, face-to-face conversations. FWIW means a piece of information may or may not be useful or of value to another person; however, the person using FWIW believes it's more than likely the information is indeed useful. It's similar to saying, "This may or may not matter," or "If it helps," in reference to potentially useful or valuable information. FWIW can be used at the beginning or at the end of a sentence. The acronym is often used to help express practicality, optimism, and consideration for another person's feelings. In these cases, FWIW conveys the message a person is just doing their best to try to help. It might also convey the message a person should take advantage of the existing usefulness or value of something, rather than worrying or complaining it's not as useful or valuable as they want it to be. Sometimes, FWIW is used alongside a piece of random information a person already knows is mostly useless, biased, or self-serving. When the acronym is used this way, it's is more of a tool for expressing sarcastic humor. Friend #1: "Can't believe I slept in and was late to work on my first day. How humiliating..."
Friend #2: "Well it's 4:54 pm on a Monday and I'm still in my PJs, FWIW." In this first example, FWIW is used to help someone else feel better about their personal situation. Friend #2 uses it to encourage Friend #1 to see things from a broader perspective in hopes of lightening their spirits. Friend #1: "My internet was down and now all the electives I wanted to take this semester are full... Seriously just my luck! Ugh." Friend #2: "FWIW, there are still openings for the psych and astronomy classes. I heard they're pretty good." This second example shows how FWIW can be used to help someone think more practically and optimistically. Friend #2 uses it to inform Friend #1 there's probably nothing they can do to get into the elective classes that they want, but there are still some good options out there. Facebook status update: "FWIW, Dinosaurs was the best TV show of all time"
This final example shows how FWIW might be used in a sarcastic, humorous way to share something that really has no value at all. This Facebook user uses it to simply share a random opinion about a TV show, perhaps hoping to attract a few likes or comments from friends who agree. What in the World Does OTW Mean? What in the World Does TFTI Mean?